It was 0200 in the morning. A big resounding dong from somewhere above me woke me up with a start! It awoke few other people too. Dongs are common within the pitroom section of the Laws building, but nothing ever of this magnitude. We were experiencing a particularly strong wind, with gusts of up to 55 knots shaking the building. A loud "dong" on the roof somewhere above my room was heard. However, I thought nothing more of it, turned over, and went back to sleep. 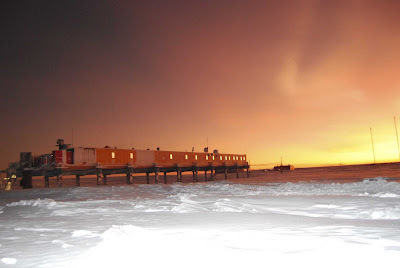 Life at Halley plods on. Several signs are beginning to emerge signifying that we are all spending too much time in one another's company. Names are a classic example. It is becoming more and more commonplace to accidently mix peoples names up. I'm not talking about simply calling one person someone else's name (although that does occur quite regularly also). I'm talking about the juxtaposition of fragments of peoples names. Dean often absentmidedly mixes my name with Joe and calls me "Jave". Which isn't so bad really...I have on many occasions been heard to both call Joe or Dean "Jean". And the girls don't escape either. I am often finding myself calling Hannah a combination of her own name and Ags' to produce "Anna". 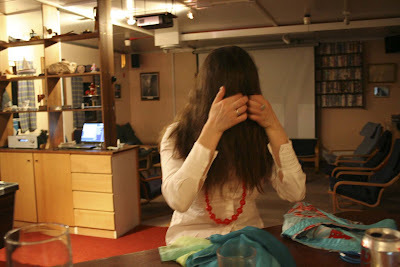 But poor Ags get's the worst of it when I find myself in an awkward position after calling her "Hags"! And so began 24 hours of bizarre events. 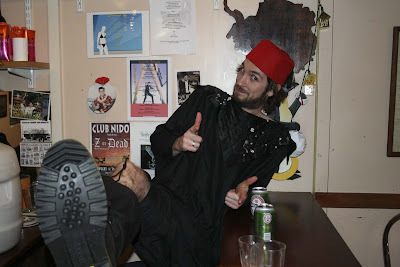 After a couple of weeks recovery from the mid-winter celebrations / jam-packed social activities, it was soon time to have another theme night. Ags proposed a Polish night for Saturday 5th. With a name like Agnieszka Fryckowska, we had never disputed her claim to a Polish heredity. Nor had we disputed that she could cook Polish food. And good job we didn't...it was gorgeous. 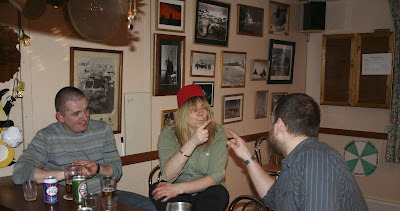 The night was loosely a theme, but with the come-down from mid-winter there were not many takers for dress up. In fact, the only people who ended up dressing up was Hannah and myself. Hannah came as a Polish gypsy and I came as a very dodgy looking cossack. Unfortunately, any photos I have came later in the evening. By this time, many of the layers of clothing I was adorning had gradually come off, revealing me in my underlayer...some crazy woman's one-piece star-fish outfit! 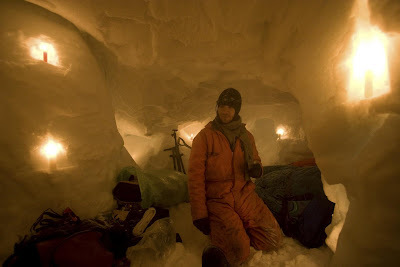 Us actors do have to improvise down here in Antarctica. Joe attempts to show Ags' his meaner side...but failed to realise he was sitting on it! The high winds we were experiencing this particular weekend were to be the cause of many consternations for the next 24 hours. First was the fire alarm going off unexpectedly. A false alarm, but totally unexpected...causing every one of us to totally soil our underwear. We all acted as trained in a professional manner even if it was very late Saturday night. Sunday morning the ladies toilet grifter pump blocked. 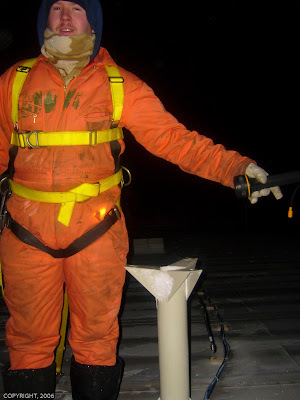 The grifter is the device which pumps human waste from the temporary tank down into the main waste. 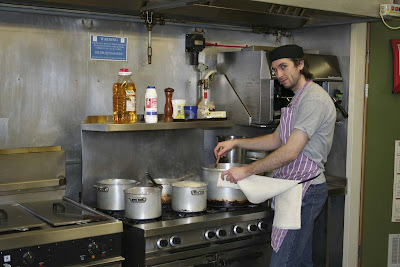 Les was on cook duty, but also had to sort this little problem out too. I was trying to ignore the fact that he was juggling cooking and potentially dealing with with human waste at the same time! Sunday afternoon was no better. The melt-tank chute was blocked from over-zealous digging the day before. A team consisting of Joe, Bryan and Dean had to go down into the tunnels and unblock it before we could even start filling the tank for the day's supply. And then was the dodgy radiosonde data from the weather balloon on Monday morning. And of course the mysterious dong on Monday night. And the dodgy radiosonde data again on Tuesday. Science had been experiencing yet more problems. The radiosonde (weather balloon) from Monday and Tuesday mornings were transmitting sporadic telemetry. I had a feeling that the antenna for the radiosonde system was not working properly, possibly a loose connection caused by the high winds. Dean: A bit worse than that. Dave: You mean it's fallen over, and laying on the roof somewhere? Dean: Try "it's now probably halfway to the penguin colony!" 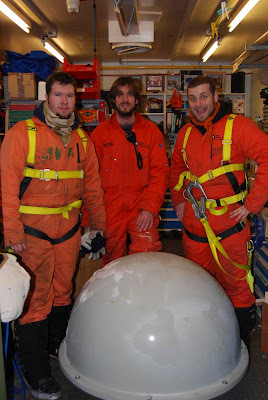 The weather balloon antenna, a 1m sq dome weighing close to 30kg, was missing! So, there it was...the source of the loud "dong" on Monday night was in fact the sound of the balloon antenna, not just simply being damaged by the wind but rather the sound of it being blown clean off its mount and launched off the roof. There was absolutely no evidence of it anywhere. No wonder why I was receiving dodgy signals and the loss of the radiosonde at a few hundred metres. Amazingly, after myself, Dean and Joe searched for 30mins, we found it. 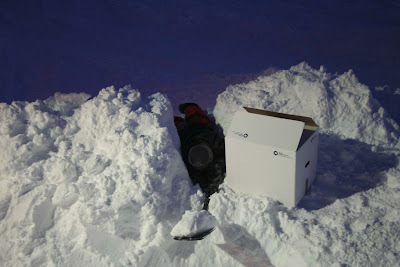 Imagine yourselves searching for a white object in the snow in the pitch dark! Next problem: how the **** to get it back to the Laws?! 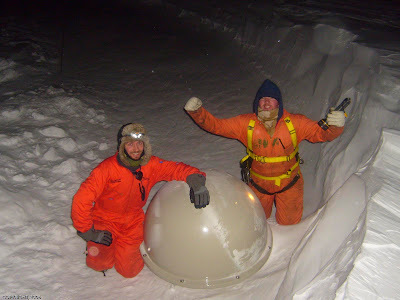 The dome had fallen into and got trapped in a wind scoop from the tented Halley VI modules 1km away! If it wasn't for those modules stopping it, it would have probably been blown 20km to the east cliffs to join the penguin colony...we would never have recovered it. Extaordinarily, the dome was relatively undamaged. 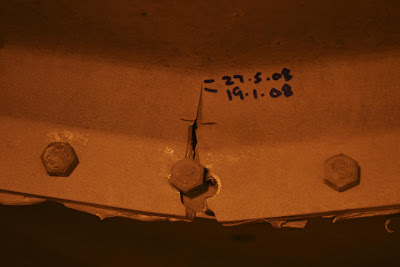 And the fittings had no evidence of being stripped off the mounting pedestal. Nature showing that it is no force to be reckoned with. In the mean time, I moved the radiosonde equipment to the Simpson where there is a spare antenna mounted on the roof over there. Lucky for me we have the luxury of a back up. Throughout the week of 7th - 11th July, horrifying screams of pain, chilling moans of torture and pant-wetting grunts of displeasure could be heard coming from the surgery. And if one listened carefully, one could also hear the sound of rigourous teeth brushing coming from the bathrooms. 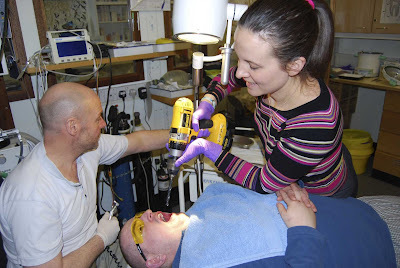 It was the week that Hannah and Lance were to act as dentists and perform their practises on us unfortunate victims/ginuea pigs. I was due to have my teeth "examined" in the afternoon. But before then, I was to go on a mini-excursion down into the Halley tunnels and help Bryan and Les refuel the "flubbers". Rubber fuel tanks = flubbers presumably. 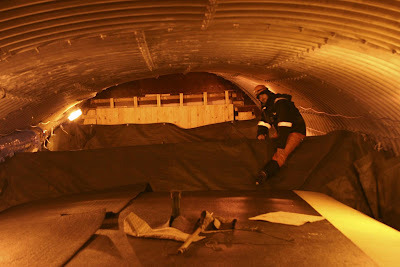 The tunnels were laid when Halley V was being constructed circa 1991. They are a set of interlinking metal boxes between the Laws, Simpson and Piggott buildings, designed to be buried as the years went on. 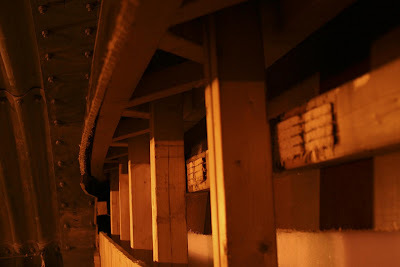 Each year or so, an extension is made to the shafts to maintain access to the tunnels, while the buildings are jacked up to keep above the accumulation of snow. The tunnels carry all the services (electrical, plumbing, comms, etc) between the buildings and also house the melt-tank and the flubbers. 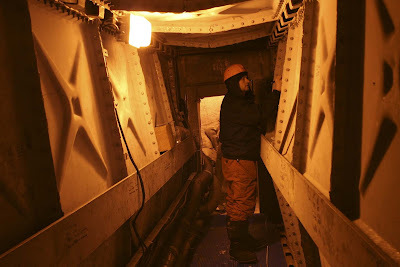 The tunnels are now approximately 30m below the surface of the ice from 18 years of accumulation. 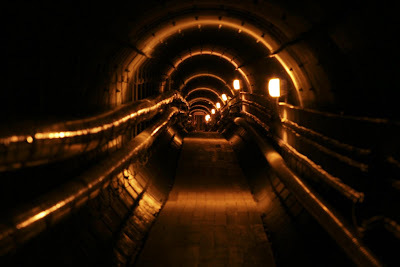 The scary thing to realise is, when at the bottom of the tunnels, you are in fact standing at around sea-level. Any crack in the underside of the ice-shelf anywhere near the tunnels could potentially result in flooding of the tunnels. But it's very very unlikely to happen. 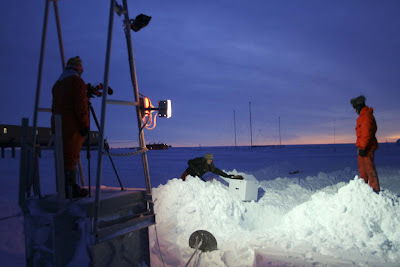 As a result of being 30m below the surface, there is a serious amount of weight and pressure pushing in on the tunnels from the surrounding ice. The forces of nature are just mesmerising to see. Looking down the tunnel towards the Simpson end. 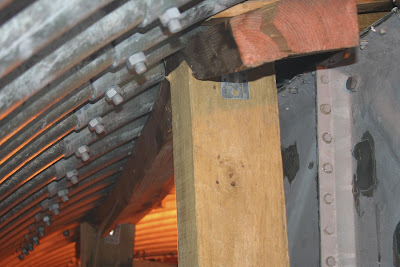 When installed the tunnels were perfectly straight! Signs of the movement of the access shaft from downward pressure. The melt-tank is in it's own separate section. It obviously has a warmer environment due to the heat pumped down there from the Laws generators to keep the snow we dig each day melted. 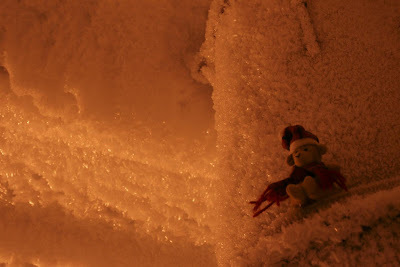 The warmer environment gives rise to some crazy ice-stalagmites. Refuelling the flubbers was complete, and after lunch it was my turn for the dentist. I could not put it off any longer. It was time to make the visit. 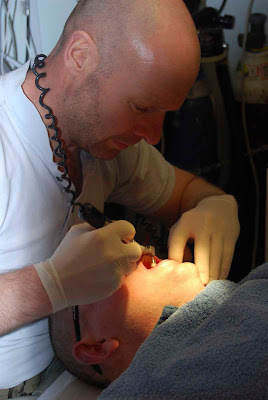 Saying that though, Lance did polish up me gnashers beautifully. Moroccan food was on the menu. 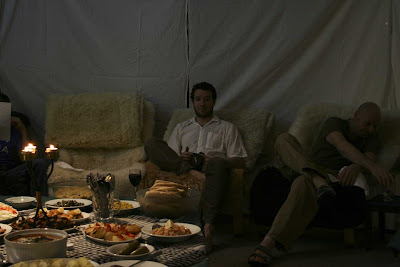 I walked into the lounge to find the room had been turned into a huge tent-like thing using tablecloths. Sheepskin rugs had been thrown all over the chairs and floor. 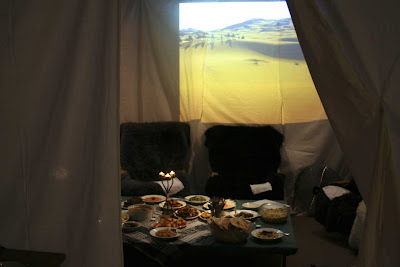 Food had been spread out on a large table, candles were lit, two fans were blowing the sheets gently to recreate a mild desert breeze, and a desert image was projected onto the back "wall". We ate. We chilled out. 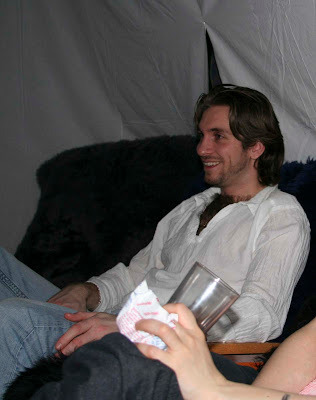 And we generally had a very relaxing and quiet Saturday evening. A well appreciated change after the manic week we all had the week prior. And then suddenly there it was. After enduring 2 months of total darkness, some light was splilling over the horizon to the north. It came so suddenly...I need to emphasise this point, because it was a beautiful things to see. Having lived in a dark cocoon for nigh-on 2-months, to even see the remotest hint of daylight was a poetic, symbolic moment. It was a sign that the sun was returning and would be with us in a matter of weeks. Although it was a slight glow lasting all but an hour, I knew the level of daylight was going to exponentially increase in magnitude and duration each day from this moment on. And I had to record the moment with my camera. Some days I really am humbled to have the job that I do. Outside work can be a real pleasure when it's as beautiful as it was on this particular day. A cloudless sky, still wind, an almost full moon, and a slight dusting of diamond dust in the air. 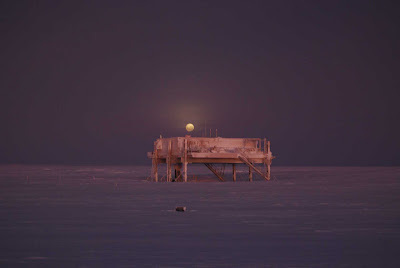 One moment the moon was out, casting long grey shadows on the snow surface, and then later, the glow on the horizon at noon would sillhouette all buildings, equipment and people in front of it. That's what Dean has dubbed it. Named after Rich who instigated the digging of a huge snow cave all the way back in January. Why do such a thing? Well, why the hell not. Where else would you get to do such a thing. And I'm glad I put all the effort into help dig it back in January, for myself, Rich, Dean and Hannah were to spend the night in the BurtCave this very Saturday. It was a chance to get away from base for the evening, and to do something completely different. 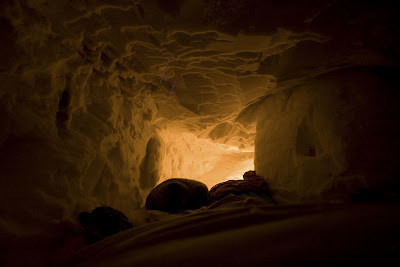 Sleeping out in a snowcave in Antarctica where outside temperatures were as low as -30C. How many people in Antarctica would be doing this very thing at the same time? None I would hazard to bet. There was a little extra digging to do during the day on Sat, just mainly to open up the entrance again and make some more room inside. 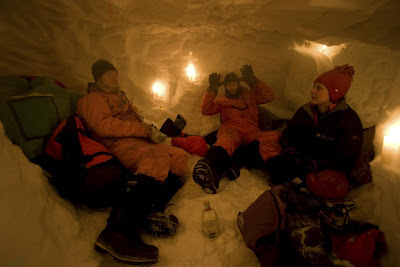 After that, we went back to the Laws for dinner, and returned to the cave with our sleeping systems, duvets, sheepskin rugs and...of course...port and whiskey! Rich Burt, looking smug in the midst of his creation...The Burtcave! 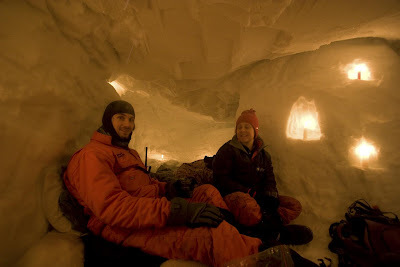 Myself and Hannah relaxing in -25C in the cave! The four of us had a superb night. Even though it was cold, it was very very relaxing. Once the nights fun was over and we were in our sleeping bags, I was more cosy and toasty than I ever have been in my pitroom back on the Laws. 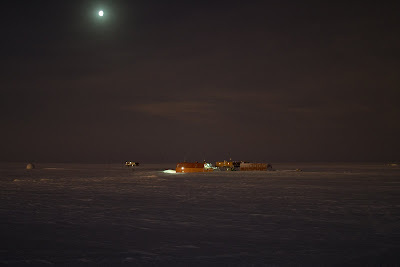 A trip to the Life of Halley GPS site at B00 was organised. 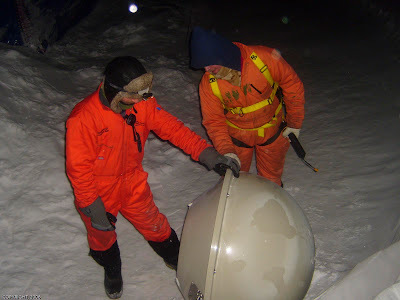 Many of the GPS sites placed by Ryan in the summer were not communicating to the logger system on the Simpson platform. 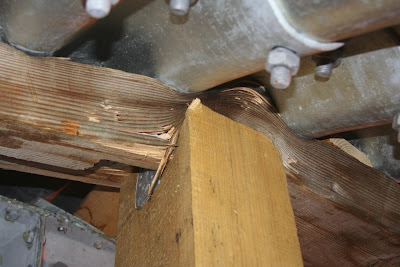 Ryan, back in Cambridge, had investigated the issue and had requested that the sites be visited to perform a quick fix. 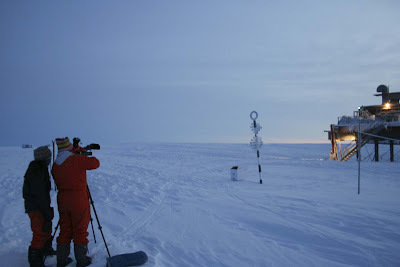 B00 was first on the cards as it was on the way to Windy Creek east of Halley. 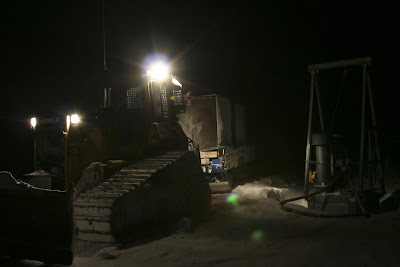 A Sno-Cat was fired up, and Les, Rich, Lance and myself were out on an excursion. First we stopped off at the GPS site so I could perform the fix, then we carried onto Windy so Les could service the door on the caboose there. 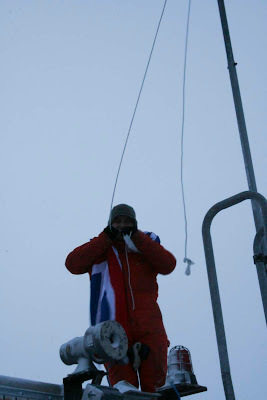 While he was doing that, Rich, myself and Lance harnessed and roped ourselves up and walked to the cliff-edge to assess the snow ramp onto the sea-ice. The reason for this is in preparation for the up-coming penguin trips. 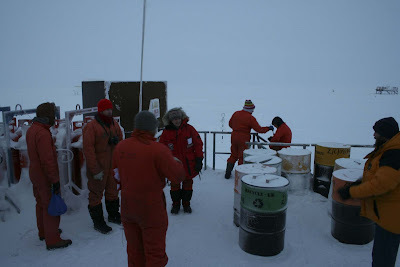 Even though it was still quite dark at noon, and the visibility was a bit low due to the weather, while standing on the cliff edge, in the distance a black blob could be seen on the sea-ice. The black blob was the penguin colony. All huddled together to keep warm from the harsh temperatures and winds. From our vantage point on the cliff, carried in the wind now and again, the sound of the penguins calling could be heard. It was a taster to the inevitable penguin trips starting late-August once the sun returns. After scanning the dark skies all winter, I was finally treated with a view of the type of clouds I was desperate to see. Polarstratospheric clouds (aka nacreous clouds). These clouds are really high up in the stratosphere, often formed from ice-crytals. 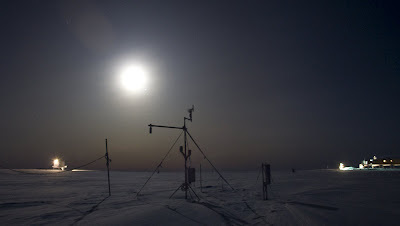 They seed the destruction of the ozone layer in the winter, as they create a base for the chlorine in the atmosphere to attach to water molecules. The chemical reaction with the O3 molecules of ozone causes desctruction of the ozone layer. 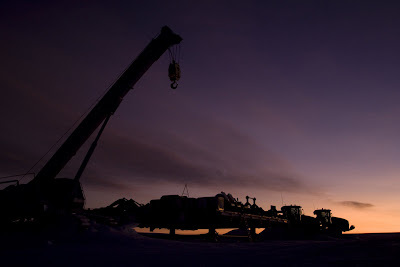 It's a process that only happens in extreme cold temperatures. Hence why the ozone hole is always associated with Antarctica and sometimes the Artic circle. 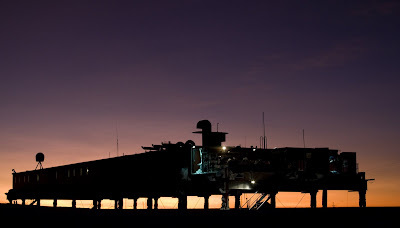 It was my turn to be on NightWatch once again. Unfortunately, I had no plans for crazy shenanigans and jokes this week, but decided to chill most of the time by reading books. 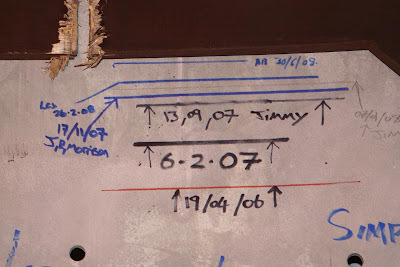 The best I could come up with on the practical joke side of things was to book the gym out (using the whiteboard on the gym door) in Paddy and Joe's names for Ballet at 2000hours! 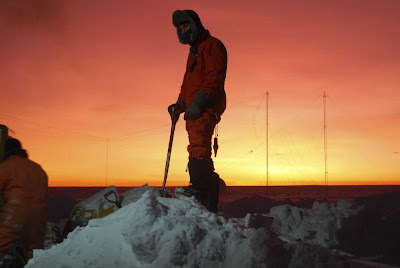 An email was sent to all the bases (all nations) in Antarctica from the Americans at McMurdo Station. Each year they have a 48 hour film competition, and they were inviting all stations to produce an entry. Produce a film in 48 hours which contains a set of defined quotes, props, persona and sounds within the film. 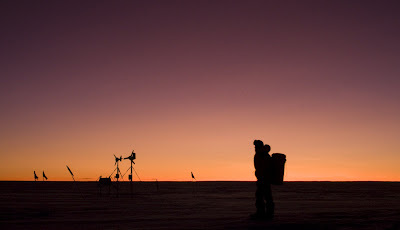 Ags, Rich, Hannah, Dean, Scott and myself signed ourselves up to produce the Halley entry. The rules came in from McMurdo on Friday night. After a meeting we had an idea for a film, Dean hastily drafted a story board, and we soon started cracking on with the filming. The box, poised for the 1st action shot of the weekend!! But we got through it. Dean's vision was recreated, albeit with a more abstract look and feel compared to the original storyboard, but it worked. The video was uploaded Sunday evening for the other bases to download. Next Saturday was to be the critical review of all entries, by all bases. 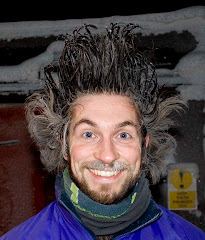 Dear God, you truly get an idea of just how crazy/odd some people can get living an Antarctic winter, no matter what nationality they are, when you end up watching their cinemagraphic "creativity"! Aside from being jealous of the scenery and amazing bases a lot of the other nations get to live in across Antarctica, you appreciate that everyone is in the same boat (so to speak). 13 entries were received from the film fesitval, ranging from the Americans, British, Australian, New Zealandish, South Africans, and Germans. Everyone had put a lot of effort into their productions, and obviously had a lot of fun making them. Some videos were very contemporary, some were promotional and many were just plain mad (funny). 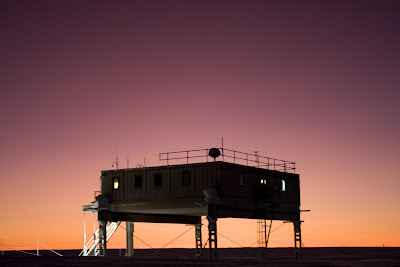 Saturday night at Halley was spent watching the other entries downloaded off the internet over the past week. Every base was asked to give an assessment rating acting, cinematography, story, and best use of the required elements. It was great fun to watch and gave one a great sense on comararderie with those living on the other bases. Sunday 10th August at 1410, according to my calculations was the time that we would be seeing the sun finally peak it's head above the horizon for a few minutes. Tradition, (just like on May 1st where we had sundown), is to have a ceremony celebrating the return of the sun to our skies. The ceremony involves the youngest member on base to raise a brand new fresh Union Flag high above the Laws, make a speech and the rest of us clap and take photos. After the complete dissing I got for my sundown prediction (I still stand by the fact I got it right and that everyone witnessed miraging for the two days following my date), I was secretly relieved to find that the day was dreary and overcast with now chance of witnessing the sun whether it was there or not! Everyone gathers on the open platform. A dull dreary overcast day. Of course, if it wasn't a dreary day, the sun would have been seen, as my calculations are flawless. Cambridge even independenly confirmed my prediction with their own predictions. 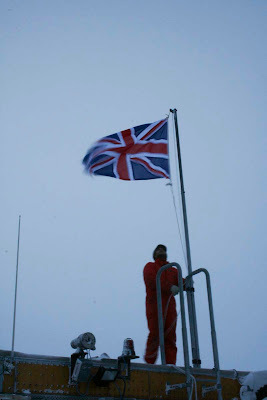 Joe hoisted the flag at the allotted time. Well, he was a few minutes late due to confusion as to how to ties a flag to a flag pole lanyard. Joe, having knotted the wrong end of the lanyard, takes to gnawing at Her Majesty's flag! After several "expert" opinions from those of us on the platform, Joe finally got the flag raised, said a few silly words (poor fellow told us he didn't do speeches), and we all went in. The flag taken down in May for Sundown was raffled off once we got indoors. 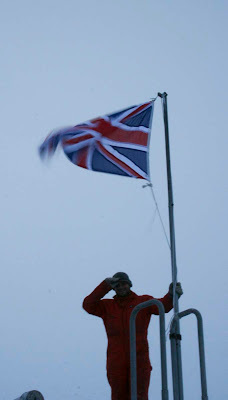 And as an insult to every Brit on this British base, the winner of the draw was resident Kiwi garage mechanic Scott! I was on cook duty that Sunday, so I whipped up a chicken chasseur for the rest of the base. Even I was surprised by how good it tasted. 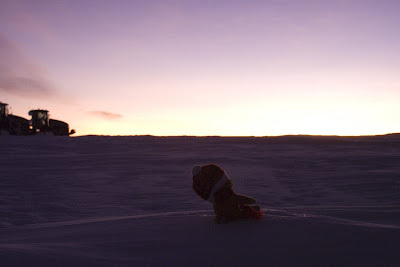 And that concludes another entry into the blog that is Dave's life on Halley Station 2008.